With four execution cores, the Intel Core 2 Quad processor blows through processor-intensive tasks in demanding multitasking environments and makes the most of highly threaded applications. Whether you're creating multimedia, annihilating your gaming enemies, or running compute-intensive applications at one time, new quad-core processing will change the way you do everything. Pioneer the new world of quad-core and unleash the power of multithreading. Marketing Information: With four execution cores, the Intel Core 2 Quad processor blows through processor-intensive tasks in demanding multitasking environments and makes the most of highly threaded applications. 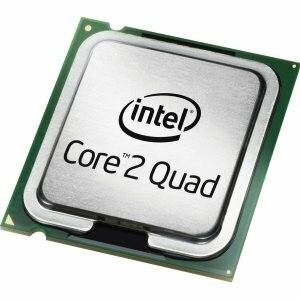 Whether you're creating multimedia, annihilating your gaming enemies, or running compute-intensive applications at one time, new quad-core processing will change the way you do everything. Pioneer the new world of quad-core and unleash the power of multithreading.